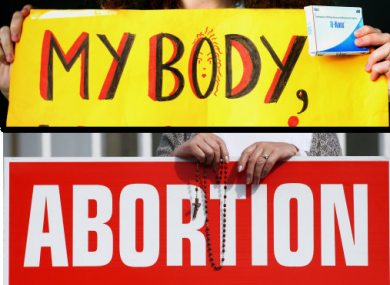 Poll: Do you want the 8th Amendment to be repealed? The issue is really back on the agenda. Two signs at a pro-life and pro-choice march. THE DIVISIVE ISSUE of Ireland’s abortion laws is back on the agenda as we head into General Election season. That means, politicians try and avoid questions about the Eighth Amendment while campaigning groups on both sides gear up for a long and difficult pre-referendum battle. More than a quarter of people already say a party’s stance on abortion will be a deciding factor in how they vote. But what do you want in relation to the Eighth Amendment – which enacts a constitutional on abortion? Do you want the 8th Amendment to be repealed? Email “Poll: Do you want the 8th Amendment to be repealed?”. Feedback on “Poll: Do you want the 8th Amendment to be repealed?”.